There are over 800 species of bees native to Canada (200+ in the the Greater Toronto Area); some 5,000 bee species in North America and more than 20,000 species worldwide. The highly social European honey bee (Apis mellifera), the primary bee species managed for crop pollination and honey, was initially introduced to North America and most other parts of the world from Europe. Bees, which evolved from wasps, are believed to have made the scene about the same time as flowering plants. Virtually all species subsist entirely on nectar and pollen from flowers. Specialized, branched body hairs make them good at picking up pollen. Most species of bees are solitary: they do not live in colonies, and do not make honey or beeswax. Females live more or less independently and construct cells for individually laid eggs out of a wide variety of materials. 70% of the solitary bee species in N. America live in the ground, and about 30% are twig- and wood-nesters, living in pre-formed cavities such as beetle bores and hollow stems in bramble. 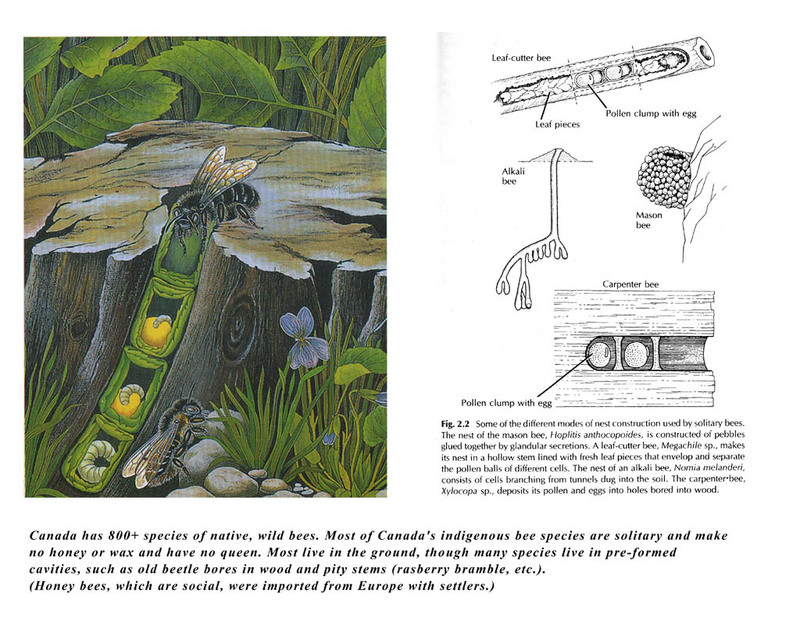 There are various flavours of ‘social’, described in more detail in the article “Bees of Eastern Canada” and in the book “Keeping the Bees” by Laurence Packer (see ‘resources pages’). Solitary bees do not defend their nests, except from their enemies such as cuckoo bees and wasps, which sneak into their nests, and occasionally birds or one another. They do not sting unless trapped or handled. Wasps are largely carnivores. Many solitary wasp species have similar nest construction methods to solitary bees. Wasps also pollinate, though as their hairs are not branched, most do so to a much lesser extent than do bees. Like bees, most species of wasps are solitary (do not live in hives), living here and there in bramble and earth, etc. They, too, do not sting unless trapped or handled. Social wasps such as hornets can be dangerously aggressive in defending their nests. Large, furry Bumble bees are among the most widespread and critical pollinators native to North America. Their colonies in nature often live underground in insulated hollows such as discarded mouse nests; they will also nest in discarded upholstered furniture or inside fiberglass-insulated walls. Started by single queen bees, their social colonies grow throughout the summer months and naturally die off by the first frost, with numbers per nest that range greatly from the Arctic to the South. In the autumn, the mated new queens then find different underground locations in which to over-winter to start a new colony cycle the following Spring. This annual lifecycle differentiates them from honey bees, in which perennial colonies can last indefinitely. Bumble bees do defend their nests, but otherwise do not sting unless trapped or handled. 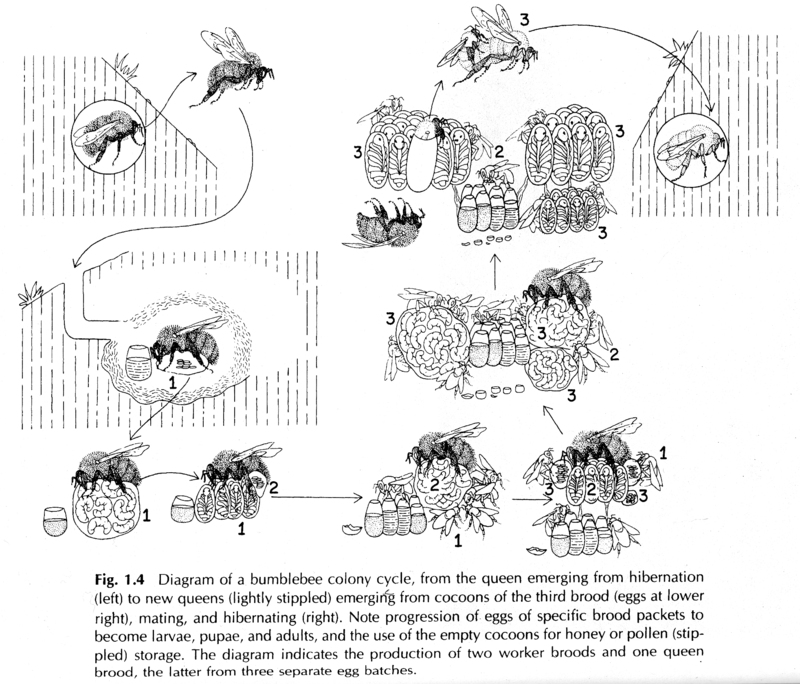 Illustrations from the book, “Bienen, Hummeln, Wespen im Garten und in der Landschaft” (colour), and, by Celeste Green and Phyllis Thompson (black and white), from Bumblebee Economics (by Bernd Heinrich). 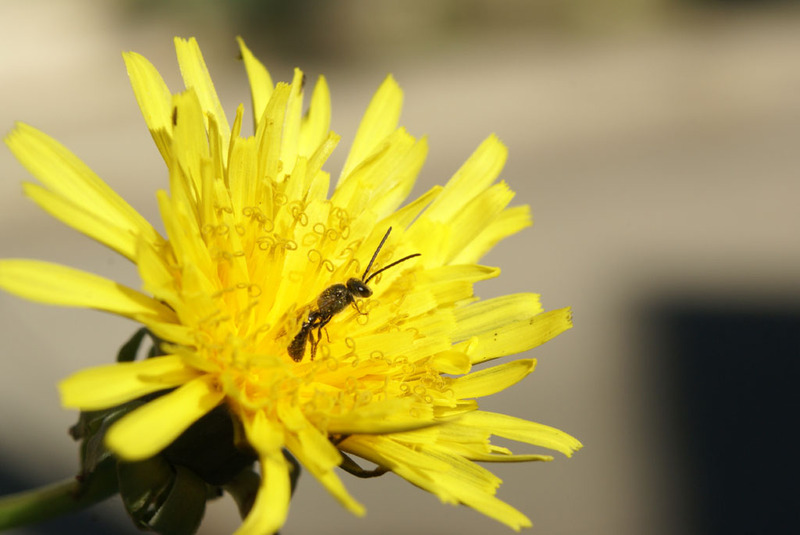 Above: a tiny male sweat bee (genus Lasioglossum) on an Autumn dandilion. 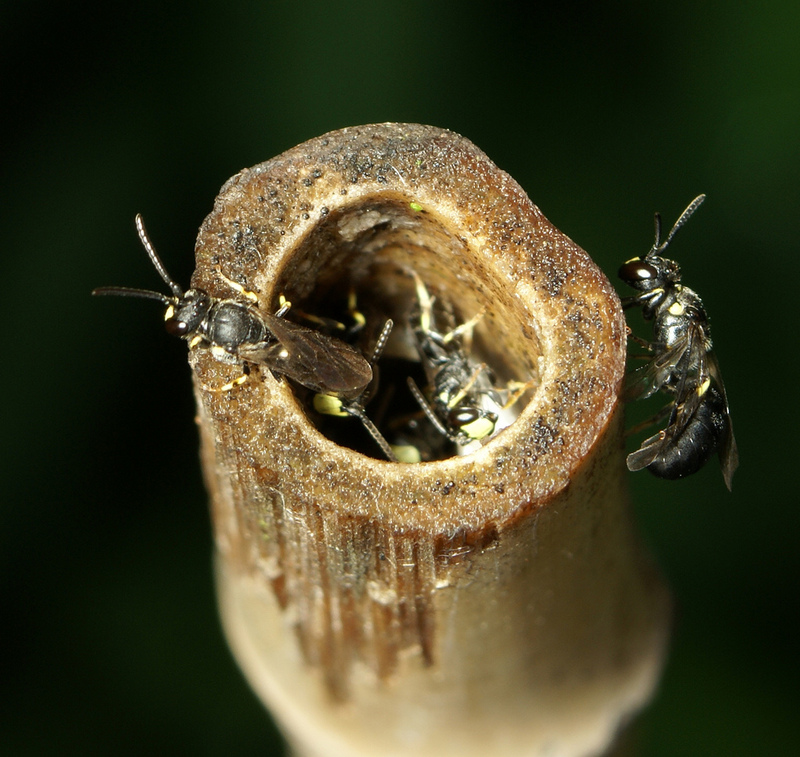 Below: Hylaeus (a/k/a ‘yellow-faced bee’ or ‘masked bee’) emerging in the Spring from a bamboo tomato stake. Photos by Rob Crucikshank. Of the variety of earth’s pollinators, bees are responsible for the majority of “pollination services” to flowering plants. The close synergistic relationship between plants and pollinators suggests that bee biodiversity—and by extension, plant and ecosystem biodiversity—is central to food security and to the health of the biosphere as a whole. Human beings have widely replaced domesticated honey bee species historically used in Asia, India, Africa, Mexico and other places with domesticated western honey bees. “Of the more than 19,000 species of bees, perhaps a dozen are honey bees, fewer than five hundred are stingless bees” (cousins of honey bees which also produce honey)*. Content prepared by Sarah Peebles. Thanks to James Thomson, Laurence Packer and Lincoln Best for editing and content assistance. Thanks to above-mentioned, Cory Sheffield and Stephen Buchmann for bee ID assistance, and to Nicolas J. Vereecken (Nico’s wild bees & wasps) and Bernd Heinrich for illustrations.